Orangutans or the orange-haired, gentle Asian primates have been classified as ‘endangered’ by the World Conservation Union. Approximately 7000 orangutans exist in the wild within the jungles of Sumatra and Borneo. Multiple efforts are now underway to protect and preserve this adorable primate so that future generations can continue to be acquainted with them. 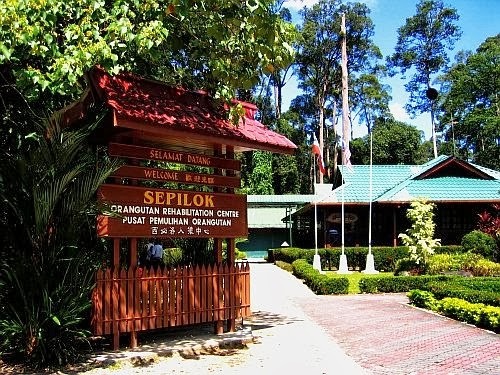 The Sepilok Orangutan Rehabilitation Centre, situated in the State of Sabah in Northern Borneo, which sits on the edge of the Kabili forest reserve, is one such effort. 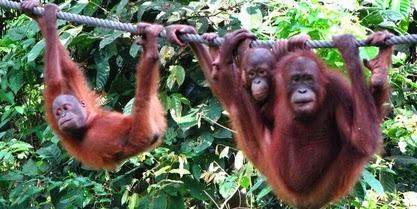 The center was set up by an English woman in 1964 to rehabilitate orphan orangutans. The center occupies 43 sq. km of pristine, protected rainforest terrain situated at the edge of the Kabili Forest Reserve. The facility hosts 60-80 orangutans who roam freely within the boundaries of the reserve along with 25 other orangutan babies who reside within the nurseries of the reserves. The Centre provides much tender loving care for the many primates who have been orphaned or then confiscated for they were kept illegally as pets. New arrivals are at first given a health check before the long process of rehabilitation is started. The ultimate goal of this effort is to release the primates back into the wild. This process of rehabilitation usually takes up to seven years. During this time, the orangutans receive round the clock, dedicated care from the center’s personnel. Aside from orangutans, the center also treats other injured animals like sun bears, gibbons, Sumatran rhinos and even Asian elephants. Orangutan babies usually live with their mothers in the wild for up to six years, during this time they are taught essential forest survival skills like climbing. 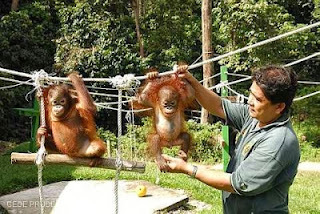 At the Sepilok facilty, the care givers use a buddy system to replace the teachings of the Mama orangutans. This buddy system features the pairing of a young ape with an older ape so that the young one can learn essential skills from his/her older companion. At the center, the apes are fed a regular daily diet, which is supplemented with feedings of milk and bananas. The diet is purposefully unchanged as the center would like the primates to develop their foraging skills when they are returned to the wild. This rehabilitation process is a lengthy and expensive affair but the center does not hold back from accepting any orphaned or rescued orangutan brought to its premises. The center is today run by the Sabah Wildlife Department which receives some funds from the Sabah government. The other source of funding for the center, is from ticket sales. Visitors are allowed to visit the center for viewings of the primates but they are restricted to walkways and not allowed to approach or handle the apes. Orangutans are very susceptible to human diseases so great care is taken to keep visitors at a distance from these endangered primates. Visitors are however invited to view the feeding procedures at the center, during which they can observe the orangutans come and pick up the fruit placed on the feeding platforms. However, during ‘fruiting’ season sometimes, visitors miss out on these sightings as orangutans prefer to roam and forage on their own within the center’s forest reserve. Often visitors have expressed disappointment due to the lack of these sightings but you should not feel so, for the non-appearance of the orangutans implies that the center’s efforts to rehabilitate these primates are successful and they are learning to survive on their own in the wild. The Sepilok visitor center is open to the public daily from 9 am to 4pm. If you would like to learn more about these endangered gentle giants, you must make an effort to visit Sabah’s Sepilok Orangutan Rehabilitation center. Who knows you may be lucky to spot an orangutan or two, or then if not you could always enjoy the lush sights and sounds of Borneo’s teeming wilderness.